• LED display with channel number. 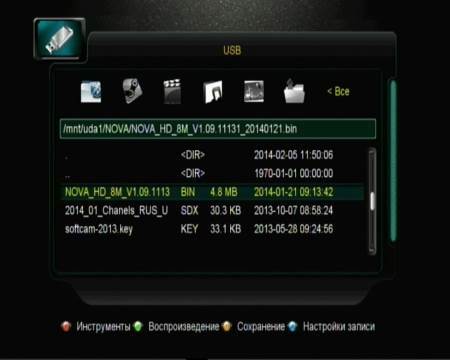 • Supported formats playable files: jpg, bmp, gif, mp3, ogg, flac, wav, mpg, avi, 3gp, mkv, mp4, mov, ts, m2ts, dat, vob . 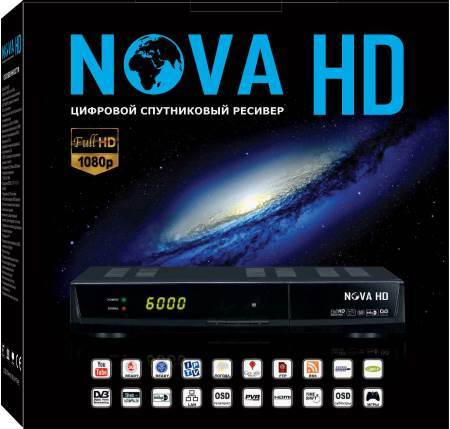 • Receiver NovaHD made in a compact body, in contrast to his predecessor Tiger T6HD. On the front panel you can see the LED display, indicators for power and signal presence, the IR port, the power button and switch channels. - USB port for connecting USB devices. Supported WiFi adapters, 3g modem. It can be used for firmware upgrades and receiver settings, as well as for playback of multimedia files. 3. Save them to a USB drive. 6. Select the firmware file (with the extension .bin) file, and then click OK. Begin the process of updating software. 7. After the upgrade, reboot the receiver.